Berry compote is a quick, easy-to-make fruit topping. 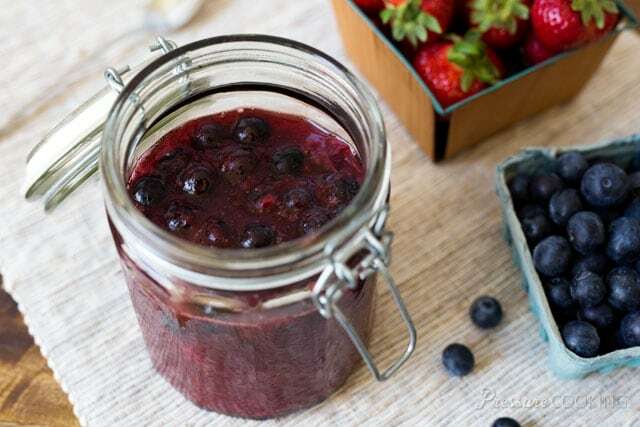 This delicious Pressure Cooker Berry Compote recipe is made with juicy, sweet fresh strawberries and blueberries. Making fruit compote in an Instapot is much quicker than making it on the stove top. A friend and fellow pressure cooker lover, Arlene Murphy, posted her Strawberry Rhubarb compote in the Instant Pot Facebook Community recently. I loved the idea of using the pressure cooker to make quick work of cooking a compote and couldn’t wait to give it a try. An Instant Pot is one of the most popular brands of electric pressure cookers. 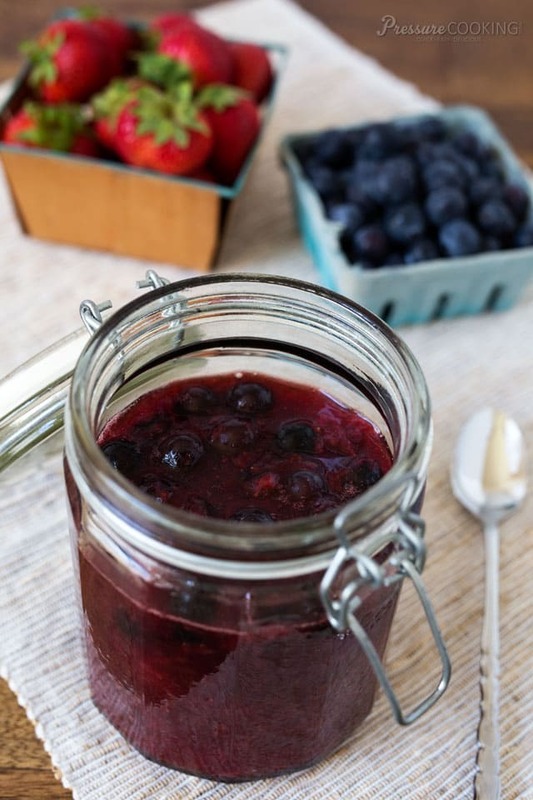 They are easy to use and your Instant Pot can help you create this fresh berry compote recipe! If you are a new pressure cooker user, you can find lots of great tips and suggestions in my post, Getting Started with Your Electric Pressure Cooker. Since the 4th of July is right around the corner, I thought it would be fun to use blueberries and strawberries to make red, white and blue desserts. For my berry compote, I left most of the blueberries uncooked so the blue of the red, white and blue would be very prominent. However, I did add 1/3 cup of the blueberries to the strawberries so the red color of the strawberries would look more red. Sometimes when you cook strawberries you get a pink color. I added a little lemon juice to add some tartness to the compote and help dissolve the sugar. The fruit released plenty of water so the pressure cooker didn’t have any problems coming to pressure. In fact, after pressure cooking, I decide to thicken the compote just a little bit with a cornstarch slurry. If you preferred, you could also simmer the fruit after pressure cooking to thicken the sauce without using the cornstarch. I served my pressure cooker berry compote over cheesecake. I’ll share the red, white and blue cheesecake recipe next week. Then the leftover compote I served over buttermilk pancakes. It would also be fabulous stir in to pressure cooker yogurt, over pound cake, or ice cream. The possibilities are really endless. I hope you’ll give it a try. 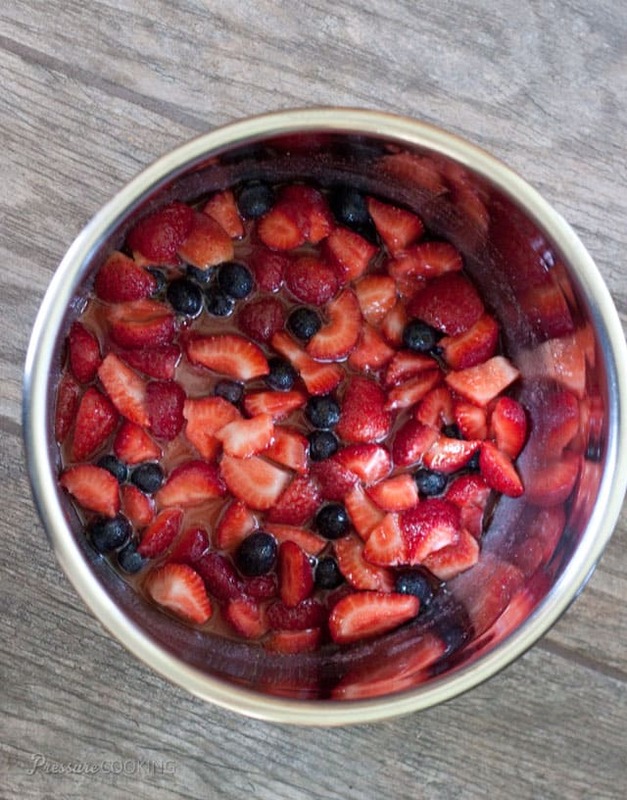 Add strawberries, 1/3 cup blueberries, sugar, and lemon juice to pressure cooking pot; stir to combine. Lock the lid in place and select High Pressure and 3 minutes cook time. When beep sounds turn off pressure cooker and use a natural pressure release for 10 minutes. After 10 minutes, release any remaining pressure with a quick pressure release. In a small bowl, whisk together cornstarch and water. Add to compote in pressure cooking pot. Bring to a boil using the saute function, stirring constantly. Stir in remaining blueberries. Put in a storage container and cool to room temperature. Refrigerate until ready to serve. Hi Barbara , This is Rayann. I am intrested in making this compote but was wandering do you think this would work in the pc with frozen blueberries and frozen strawberries? I have a bunch in my freezer to use up. Hi Rayann – yes, frozen fruit works as well. I used frozen blueberries in this recipe https://www.pressurecookingtoday.com/pressure-cooker-blueberry-compote/ Enjoy! Made this compote with a bag of Trader Joe’s frozen strawberries and some frozen blueberries. Easy and delicious. Can any fruit be made into a compote like this? Like Mango? Apples? What about grapes? Many fruits that release a lot of juice when they cook can be made into a compote. Apples you’d get applesauce. I’m not sure if Mangos release enough juice but you could add a berry with them. I’ve never had a grape compote but you could definitely give it a try. Let me know what you try. I have always been a savory person and now you’ve got me hooked on sweets. Thanks, Barbara. This is really good! I gave some of it to family so I wouldn’t eat it all to myself. I made this just now and it is, oh so good! I like that the bulk of the blue berries are added at the end, it gives the compote more texture. I’ll be making a tripe batch next for a Mother’s Day celebration this weekend. It will top cheesecakes! I can’t wait! Thank you for sharing. I found you via this recipe on Pinterest and will be browsing for more amazing eats. So glad you found me and that you loved it. Have a wonderful Mother’s Day. I just wondered if I could adapt this to blackberries? My daughter wants blackberry cobbler for her birthday. I LOVED how the blueberry compote came out and just wondered if you thought I could just sub the blackberries for the blueberries and strawberries. What do you think? Hi Krista – nice to hear you loved the compote. You’ll have a lot of seeds if you use all blackberries. I’d be tempted to pressure cooker blueberries and then add the fresh blackberries. But if you don’t mind the seeds, I don’t see a reason it wouldn’t work well. Let me know if you try it. Sounds amazing. How long would it last in the fridge? Or could you freeze it? Hi Leslie – I would use it within a week in the fridge. I haven’t tried it, but I think it should freeze well. Can I double or quadruple this recipe? I have 20 pounds of fresh blueberries I want to make quick progress through. And could I just do blueberries? I don’t have strawberries. I use your website several times a week but I have never commented. This compote changed the lurking part! It is out of this world as are the rest of your pressure cooking recipes! For readers who may need these changes, here’s what I did. I doubled the recipe to use for yogurt during the week, in addition to the cheesecake. I had fresh blueberries but only frozen strawberries. They worked just fine. I thawed them only enough to cut them. I reduced the sugar in the recipe because of a diabetic husband. We reduce the sugar is almost any recipe we use. I used a half cup of white sugar and a half cup of coconut sugar (lower glycemic index) and it was plenty for us. But our taste buds are very sensitive since I reduce sugar in most desserts. I only had 2 T of lemon juice and used that in the dubled recipe. Thanks for your awesome website! Hi Denise! Thanks for taking the time to comment and share you tips on making this recipe more diabetic friendly. So glad you’re loving my recipes. Hugs! I just keep coming up with new Uses for this stuff, it’s so good! This week I made a Pressure cooker breakfast cake, put scoops of the compote Into the batter and swirled it throuought. My kids thank you again for the being the source of so many good breakfasts ? Hi Marci – I love the sound of a breakfast cake. That’s definitely right up my alley. Great idea! Thanks for the yogurt link Barbara! The compote is delicious! I swirled it into my yogurt and froze it in Popsicle molds. My kids were in heaven and what a healthy way to cool down! Hi Lorie – I think I’d cook it without any sugar and then add Splenda to taste at the end. Barbara, did you do this in your insta pot? Would this work with the stove top PC? Awaiting your answer to make this!! Tks in advance. Hi Lisa – I did pressure cook it in the Instant Pot. I think it should work just fine in the stove top PC too, as long as you don’t get a lot of evaporation while you’re cooking. I did do it on the stove top and it sputtered the juice some and made a noise but once turned down it was ok. I thought not to do it again as I thought it would clog the hole on top but after tasting, I said I gotta’ do it again!! Can’t wait to try on my yogurt w/ granola. Best yet! Tks for the recipe and the reply! Can this recipe be double? Hi Valerie – I haven’t tried it, but I think it would work great doubled. Sounds delish. Leftovers could also be stirred into oatmeal. Thank you for sharing. Thanks Susan – I’ve updated the recipe. 🙂 You’re right, it would be great stirred into oatmeal. do you think this would work with stevia? Hi Jennie – I don’t cook with Stevia much, but I’d probably pressure cook it and then add the Stevia to taste. I have been making yogurt in my Instant Pot ever since I go it, about 8 months ago. I like a compote mixed into it as well, and hope you don’t mind my sharing how I make mine. I buy frozen mixed fruit, in my case a mix of blueberries, raspberries an blackberries, put a couple of days worth in a bowl, sprinkle with some sugar which helps to draw out the juice, and let thaw. I then mix some Instant Clear Jel with some sugar and stir that into the mixed berries until it has thickened to where I want it. That’s it. Easy and delicious. Thanks Elsie! Sounds like a great, easy way to make it too. What a fabulous idea! And what perfectly delicious ways to use it…cheesecake and pancakes? Sign me up! 🙂 I just finished making Strawberry Rhubarb Jam (not in the pressure cooker though). I know Bob and I would love your compote. Hope it’s a good blueberry picking season-this would be a perfect recipe to use them in. Can I can this? Hot water bath or pressure cooker. I have frozen fruit I need to use up.